NES The Guardian Legend (USA) in 42:38.15 by Zakky the Goatragon. 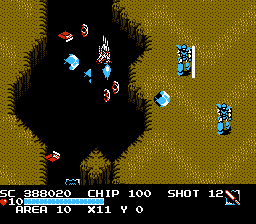 The Guardian Legend, known in Japan as Guardic Gaiden (ガーディック外伝), is a 1988 action-adventure/shoot 'em up video game developed by Compile for the NES, notable for its fantastic graphics and sound. Here Zakky uses a variety of skips and glitches to beat this lengthy game in record time.